In 1973 the two most highly-sought recruits in Texas were Earl Campbell of John Tyler H.S. in Tyler, and John Washington of Dallas' Franklin D. Roosevelt H.S. Campbell was a thumping runner even then while Washington set state records of 140 career receptions for 2973 yards. Washington's fifty-five receptions for 1331 yards and thirteen touchdowns made him an All Everything choice. An immediate star at ASU, John Washington was now known as John Jefferson due to a decision to use his father's last name of Jefferson instead of his stepfather's surname of Washington and in 1975 he helped lead the team to its fantastic 12-0 season with fifty-two catches for 921 yards. One of those receptions is still known as "The Catch", a fingertip grab an inch above the turf to defeat rival Arizona. All WAC in 1975 and '77, a consensus All American in 1977, he played forty-two consecutive games in which he caught at least one pass. His 188 career receptions for 2993 yards are still marks to beat at ASU. A first round draft choice of the Chargers, Jefferson burst upon the pro scene as he had at Arizona State, in spectacular fashion. He made the NFL All Rookie team and four Pro Bowls in eight years, highlighted by his 1980 performance of eighty-two catches for 1340 yards and thirteen TD's. Unfortunately, only his first four seasons were spent with the receiver-friendly Air Coryell Attack of the Chargers as contract negotiation difficulties caused his trade to the Packers where his four years there resulted in approximately half the production he enjoyed at San Diego. After a three reception appearance with the Browns in 1985, Jefferson retired with much unfulfilled promise of greatness and went on to become Director Of Player Development for the Washington Redskins. 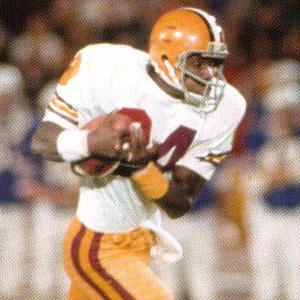 John Jefferson remains, for all Sun Devils players and fans, one of their greatest players of all time and he was inducted into the College Football Hall Of Fame in 2002. In 1976, Jefferson enjoyed the distinction of wearing a helmet that was different in design than the rest of his teammates. On his sunflower colored helmet, he sported a one-inch white center stripe with one-inch maroon flanking stripes. While the Sun Devils’ sunburst logo was the same, the three-stripe arrangement allowed Jefferson to stand out every time he took the field, not only for his spectacular play, but in a manner that allowed him to be a bit more visible to his quarterbacks seeking out a sure-fire reception.